One of the very best riders in the country this year, Dermot Trulock has taken a strong win at the Laragh Classic. Trulock arrived at the top of Wicklow Gap on the second passage today on his own by about 20 seconds. The Lucan CRC man had earlier bridged across to the leading riders after a four-man breakaway took flight. 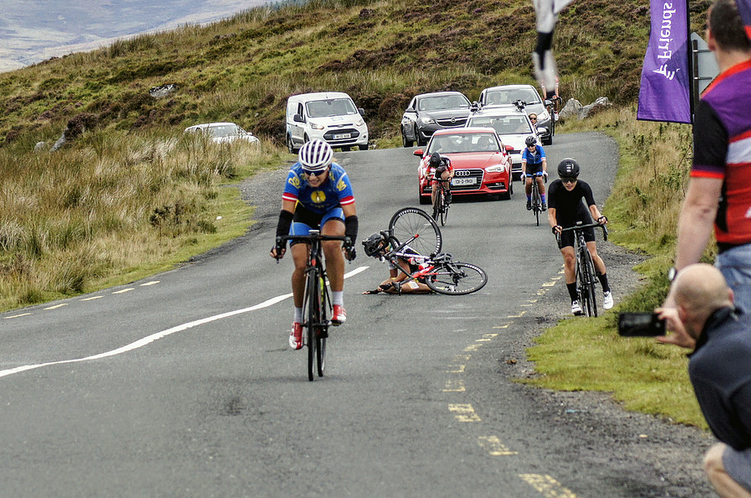 And as the pressure was applied second time up the Wicklow Gap he proved strongest. 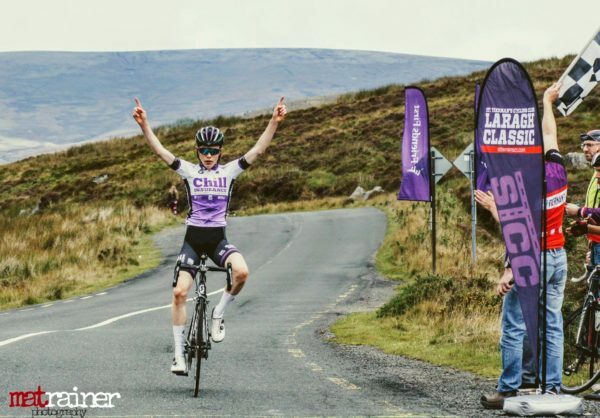 In the women’s classic Hannah Gruber-Stadler, a visiting Austrian rider set to take on Rás na mBan next week, won the day. She was just clear of a fragmenting group on the run-in to the finish line, being chased by Imogen Cotter (Burren CC) and Aine Donegan (Scott Orwell). The two chasers were trying desperately to get up to Gruber-Stadler when a crash occurred. Donegan, a new find on the home scene this year, hit the deck very hard at speed. Cotter managed to get around her and stay upright to take 2nd place. And while Donegan eventually got over the finish line, she was passed by several riders. Lauren Creamer (Brotherton Cycles) was 3rd from Katharine Smyth (Ballymena RD) and national champion Eve McCrystal (Garda CC), in 5th place. Donegan, who literally limped home after her smash, still took 6th place. In the men’s race the field did not split despite aggression in the early stages. However, it did fragment on the first climb of Wicklow Gap. While it came back together again, a strong breakaway got clear on the main road before the steep Hollywood climb. In that four-man group were Ben Walsh (Vitus Pro Cycling), Conor McCann (Inspired Cycle), Angus Fyffe (Caldwell Cycles Omagh) and Andy Maguire (Gerard-DHL). When the leaders hit the gap for the second and final time, they still had about a minute. It was at the bottom of the ascent that national hill climb champion Darnell Moore let rip. The Caldwell Cycles man struck out and got clear solo in pursuit of those ahead. Trulock went after him and they combined on the climb for a time. Trulock then succeeded in picking off and distancing those ahead of him to win; from McCann, Walsh, Moore and Conor Hennebry (Viner-Caremark-Pactimo) in that order.